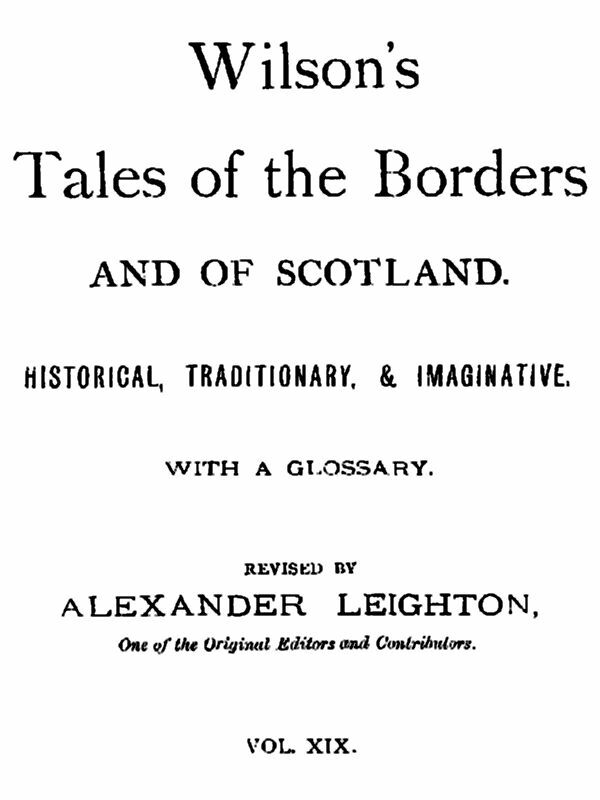 Distributed Proofreaders has posted the last of the 24 volumes of Wilson’s Tales of the Borders and of Scotland: Historical, Traditionary, and Imaginative. The original 66 stories were collected by John MacKay Wilson (1804-1835). He began publishing them weekly in 1834 as editor of the “Berwick Advertisor.” His unexpected death at age 31 the following year left a widow with an inadequate income. The executors of the estate and friends of the family then gathered a further 233 tales, which were published for her support. Alexander Leighton, one of the major contributors of stories, published the collection in the 24-volume set which is now complete at Project Gutenberg. The short stories of these collections paint vivid pictures of life in the Borders — deaths and marriages, shipwrecks and celebrations, the ordinary and extra-ordinary events in the lives of people living on the edge of both Scotland and England. These details and more about the tales and the editors of the collections can be found at The Wilson’s Tales Project. Hundreds of Distributed Proofreaders volunteers collaborated for over ten years to ensure the wide availability of these delightful and historical tales. The first volume was posted in February of 2004, and the last in September of 2014. There were several challenges facing the DP team in their effort to accurately render the tales as the editors intended. In addition to period spelling and grammar, the tales are full of words from the local dialect and dialogue modified to help the reader hear the border speech patterns. These contribute significantly both to the charm and the historicity of the tales, but also caused thousands of words in each volume to fail traditional spell-checkers and to need verification, sometimes with research. Congratulations to the Distributed Proofreaders team, who have continued the work of Mr. Wilson to preserve these stories for future generations to enjoy. This post was contributed by a DP volunteer who worked on Wilson’s Tales. This entry was posted on Wednesday, October 22nd, 2014 at 12:01 am and is filed under Book Review, Project Gutenberg. You can follow any responses to this entry through the RSS 2.0 feed. You can leave a response, or trackback from your own site. Thank you so much for the insight into how and why the collection began.